QB Chase Hansen, offense almost unstoppable in school's historic victory. Chris Detrick | The Salt Lake Tribune Lone Peak's Chase Hansen (15) runs the ball during the 5A Championship game at Rice-Eccles Stadium Friday November 18, 2011. Lone Peak is winning the game 28-13. 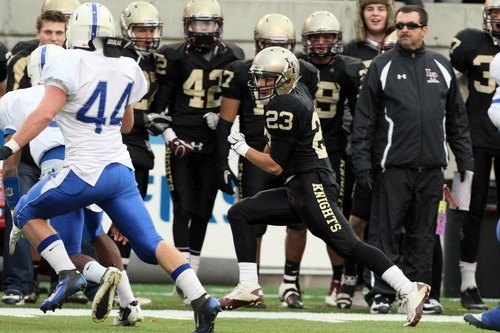 Chris Detrick | The Salt Lake Tribune Lone Peak's Connor Humphrey (23) runs the ball past Freemont's Austin Black (44) during the 5A Championship game at Rice-Eccles Stadium Friday November 18, 2011. Lone Peak is winning the game 28-13. Chris Detrick | The Salt Lake Tribune Lone Peak's Chase Hansen (15) runs the ball past Freemont's Jordan Preator (6) and Freemont's Justin Pingree (34) during the 5A Championship game at Rice-Eccles Stadium Friday November 18, 2011. Lone Peak is winning the game 28-13. Chris Detrick | The Salt Lake Tribune Lone Peak's Chase Hansen (15) runs the ball past Freemont's Jordan Preator (6) during the 5A Championship game at Rice-Eccles Stadium Friday November 18, 2011. Lone Peak is winning the game 28-13. Chris Detrick | The Salt Lake Tribune Lone Peak's Talon Shumway (6) dives past Freemont's Justin Pingree (34) and Freemont's Jaz Johnstun (22) for a touchdown during the 5A Championship game at Rice-Eccles Stadium Friday November 18, 2011. Lone Peak defeated Fremont 41-21. 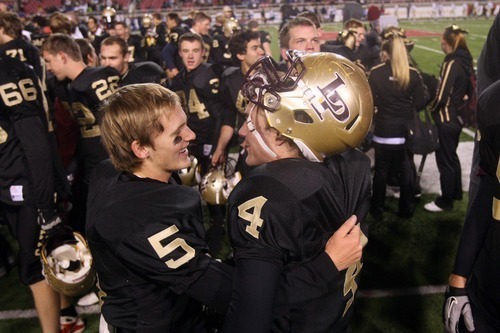 Chris Detrick | The Salt Lake Tribune Lone Peak's Tanner Smith (5) and Lone Peak's Matt Gowdy (4) celebrate after the 5A Championship game at Rice-Eccles Stadium Friday November 18, 2011. Lone Peak defeated Fremont 41-21. Chris Detrick | The Salt Lake Tribune Members of the Lone Peak football team celebrate after winning the 5A Championship game at Rice-Eccles Stadium Friday November 18, 2011. Lone Peak defeated Fremont 41-21. Chris Detrick | The Salt Lake Tribune Members of the Lone Peak football team celebrate after winning the 5A Championship game at Rice-Eccles Stadium Friday November 18, 2011. Lone Peak defeated Fremont 41-21. 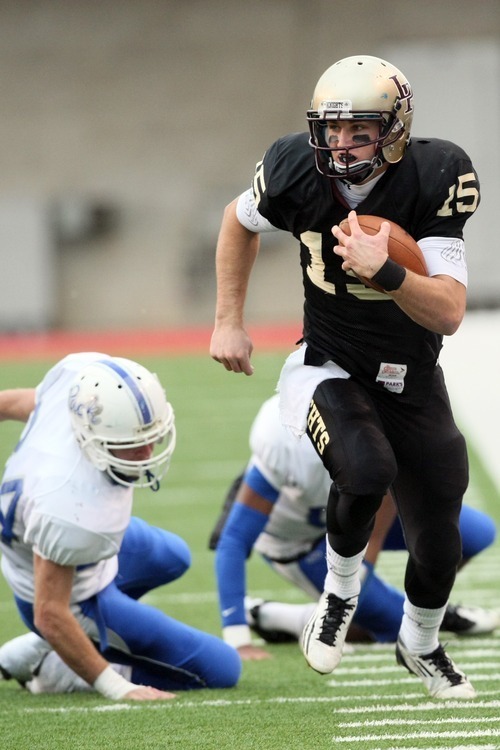 Chris Detrick | The Salt Lake Tribune Lone Peak's Chase Hansen (15) runs past Freemont's Justin Pingree (34) during the 5A Championship game at Rice-Eccles Stadium Friday November 18, 2011. Lone Peak is winning the game 28-13. Chris Detrick | The Salt Lake Tribune Freemont's Nick Vigil (5) runs past Lone Peak's Joshua Buck (40) during the 5A Championship game at Rice-Eccles Stadium Friday November 18, 2011. Lone Peak is winning the game 28-13. Chris Detrick | The Salt Lake Tribune Members of the Lone Peak football team celebrate after winning the 5A Championship game at Rice-Eccles Stadium Friday November 18, 2011. Lone Peak defeated Fremont 41-21. 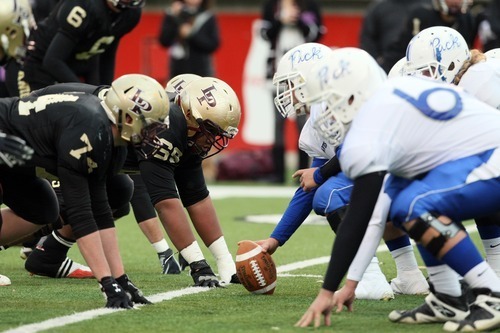 Chris Detrick | The Salt Lake Tribune Lone Peak and Freemont face off during the 5A Championship game at Rice-Eccles Stadium Friday November 18, 2011. Lone Peak is winning the game 28-13. Chris Detrick | The Salt Lake Tribune Lone Peak head coach Tony McGear celebrates with his team after the 5A Championship game at Rice-Eccles Stadium Friday November 18, 2011. Lone Peak defeated Fremont 41-21. Chris Detrick | The Salt Lake Tribune Lone Peak's Chase Hansen (15) after the 5A Championship game at Rice-Eccles Stadium Friday November 18, 2011. Lone Peak defeated Fremont 41-21. 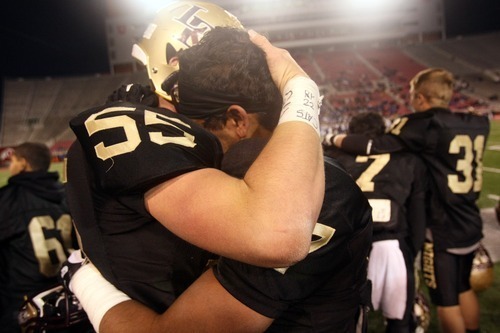 Chris Detrick | The Salt Lake Tribune Lone Peak's Justin Simpson (55) and Lone Peak's Alayzain Rizav (17) embrace after the 5A Championship game at Rice-Eccles Stadium Friday November 18, 2011. Lone Peak defeated Fremont 41-21. 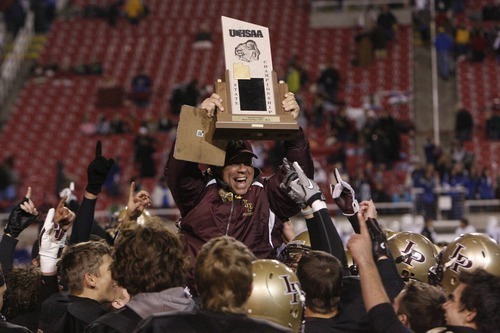 Four years ago, Tony McGeary took over a Lone Peak football program that went 2-8 the previous season. The Knights were considered strictly a basketball school then. Morale was low, expectations were even lower, and in many ways, McGeary was starting from scratch. It hasn't taken McGeary long to build Lone Peak into a powerhouse. 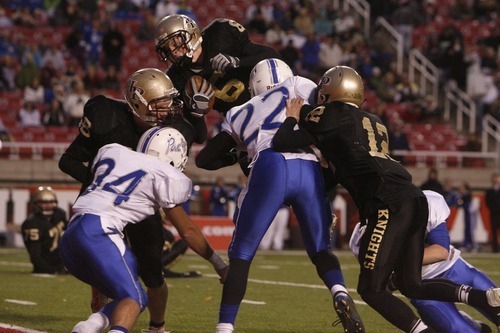 On Friday afternoon, the Knights climbed to the top with a 41-21 win over Fremont in the Class 5A state championship game at Rice-Eccles Stadium. 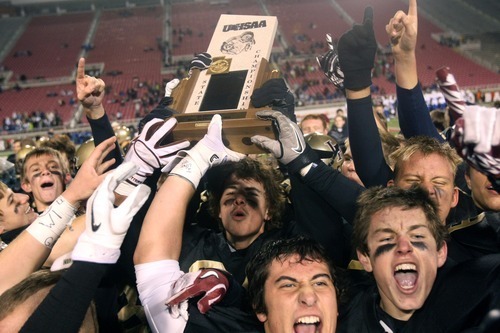 For Lone Peak, it's the first football title in school history. These Knights went unbeaten this year, and mostly unchallenged behind the wizardry of quarterback Chase Hansen, an explosive defense and an offense that has looked unstoppable at many times. "It was a process for us," McGeary said. "We have built around some great kids, and we've worked very hard to get to this point. You have to give the credit to the kids. They really bought into what we were trying to do. They were excited that we were running a passing offense, and they got better. They were great today, and they were great all season. I'm very proud of them." Hansen, as he has been all year, was a big story. 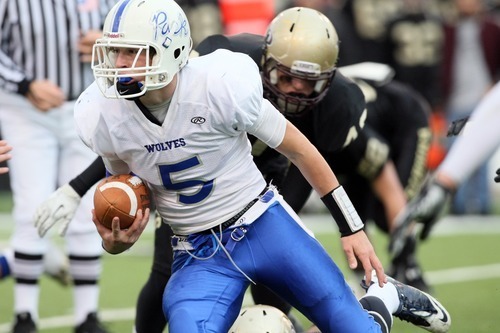 The senior, who will play on this field again when he gets to the University of Utah, his college destination, accounted for 475 total yards against the Silver Wolves, who have lost two consecutive years in the state championship game against heavily favored opponents. Hansen went 16 for 31 through the air for 242 yards and three touchdowns. He also ran 24 times for 233 yards and two more scores. He scrambled whenever he was in trouble. He was sacked just once. He made tough throws. He made what seemed like impossible plays look easy. "We knew that we had to put up some points if we wanted to win this game," Hansen said. "We came into this matchup with that mindset, and it worked out for us." Of course, in what was essentially a three-touchdown game, Hansen had plenty of help. Talon Shumway and Micah Hanneman both had big impacts in the passing game. 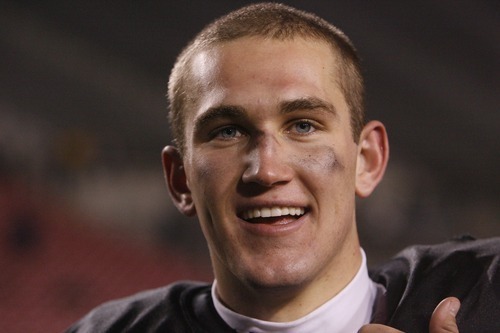 Hanneman, a BYU commit, caught two touchdown passes. And the defense was sensational, particularly with senior safety Brody Berry, who had five tackles, an interception, a blocked punt and a blocked extra point. Lone Peak came up with four interceptions in all, and the defense sacked Fremont quarterback Cooper Kelley four times. "This is the greatest feeling," Hanneman said. "This team has grown together, and we've gone through tough times together." With a 28-13 lead at halftime, the Knights weren't threatened again. Fremont star running back Nick Vigil, a Utah State commit, was held in check too. He rushed for 83 yards, but 55 of that total came on a touchdown run in the second quarter. R Lone Peak wins its first state championship in school history. • The Knights gain 522 yards of total offense. 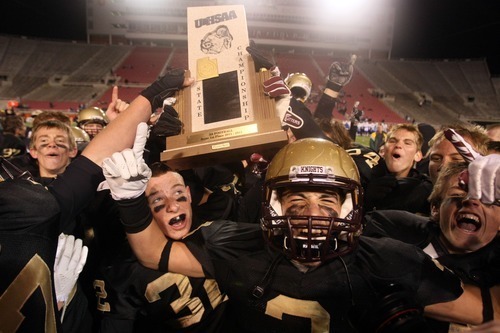 • Lone Peak finishes the season unbeaten.